We hope you’re enjoying the late summer offerings. Fall crops will likely be on the scene as early as next week- starting with some delicious arugula. We thought some radishes and other greens may be ready as well, but germination challenges in the heat paired with some fast acting weeds made this a delayed fruition. We had planned to take part in the hoop house build at Bethany Peace Church in October, but September 14 is the day! We want to thank Pastor Paul and all the people of Bethany Peace for letting us take part in the building and use of their hoop house. The house will be used as an educational, growing, and pseudo greenhouse facility. Bethany Peace and its affiliate churches are funding the materials, build, and land space. More details to follow next week. ***Melons- We are still rotating the melons. If you haven’t gotten one yet please be patient. We will get you one! Putting food up. It’s getting to be that time of year. Some summer crops abound while others fade out, but we still want to eat them. Even in winter. This week Randy put together a great couple of guides for preserving the bounty via pickling. The University of Missouri Extension guide lists precautions for safety and a load of methods and recipes. We hope you’ll make use of these terrific, simple guides. We are including them now so you can use them from now until the season ends, November 22. This week you are receiving about 2 pounds of okra…one pound of small stuff, and about a pound of large stuff. That’s a whole lot to use fresh, so see the pickled dill okra recipe on page three of the guide, particularly for the large okra. There is also a great guide on using dried beans. Please hang onto this for future weeks! Using the guide will help save money and ensure your protein. This Week’s Recipes…are all listed in the food preservation guide. 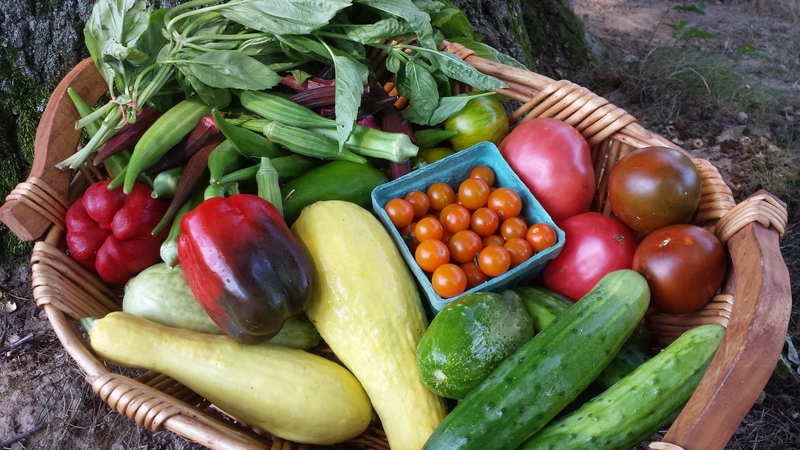 Upcoming Events: The next CSA dinner and cooking class is Tuesday, September 24. Come join us. It really is fun, like going out to eat. You also get to meet new people and learn a recipe instead of dipping into the pocket book. Our Second Saturday for September will be next weekend at Bethany Peace Church, 11952 Bellefontaine Rd, from 8 AM until the tunnel is done, hopefully before dark.